Women’s Studio Workshop encourages visitors to tour our studios, visit the gallery, observe visiting artists, and stroll through the ArtFarm! We have a lot going on here, so please call us ahead of time and schedule a date and time to visit. WSW is about 2 hours by car from the George Washington Bridge, an hour and a half from Albany, and three hours from New Haven. Rosendale is between exits 18 and 19 on the NYS Thruway (I-87). Use 722 Binnewater Lane, Kingston, 12401 when programming your GPS. Get off the NYS Thruway (I-87) at Exit 18 (New Paltz, Poughkeepsie). After the toll, at the traffic light, turn left onto Route 299, which takes you through Main Street, New Paltz. At the fourth light, turn right on to Route 32 North. 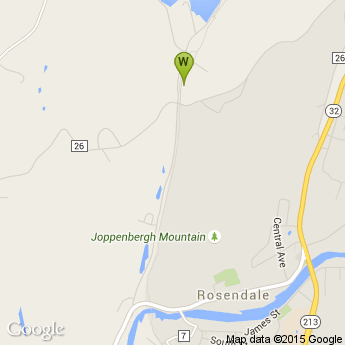 Travel about 7 miles on Route 32 to Rosendale. At the traffic light, turn left on to Route 213 West. This takes you down Main Street, Rosendale. Go through the Village for about one mile, and you will see a very tall railroad trestle. Shortly after passing under the trestle, turn right onto Binnewater Road. Drive another mile to the first crossroads. Turn right and then immediately left onto Binnewater Lane. WSW is the second building. Get off the NYS Thruway (I-87) at Exit 19 (Kingston). After the toll booth, take the first exit off the traffic circle, Route 28 West (to Woodstock and Pine Hill). Go through a traffic light and bear right on the Route 209 South (to Ellenville). You’ll be on Route 209 for about 15 minutes (approx. 8 miles). When you come to the first traffic light in Stone Ridge, turn left on to Cottekill Road. There is a sign for Ulster County Community College (UCCC) and Davenport Farm Market is on the corner. Stay on Cottekill Road past the Community College and through a stop sign. Shortly after the stop sign there is a fork in the road. Bear left (the name of the road changes to Sawdust Avenue). Follow Sawdust Avenue until you come to a stop sign. Go straight through the intersection then make an immediate left on to Binnewater Lane. WSW is the second building. Take the Adirondack Trailways from NYC or Albany to Rosendale. We would be happy to pick you up and bring you to the studio, which is only about 2 miles away from the bus station. Stewart International Airport is 45 minutes away and Albany International Airport is an hour and a quarter away. We can arrange shuttle service for you for $50 per trip. If you fly into the NYC area (La Guardia, Kennedy or Newark airports), it is easy to get here via the New York Airport Service bus to the Port Authority in Manhattan. Catch the Adirondack Trailways bus to the Rosendale Station from Port Authority.